ABSTRACT. Recently, a family of multispecific organic anion transporters has been identified, and several isoforms have been reported. However, the physiologic and pharmacologic roles of each isoform, except OAT1, in the transepithelial transport of organic anions in the kidney remain to be elucidated. To address this issue, it is essential to determine the intrarenal distribution and membrane localization of each OAT isoform along the nephron. 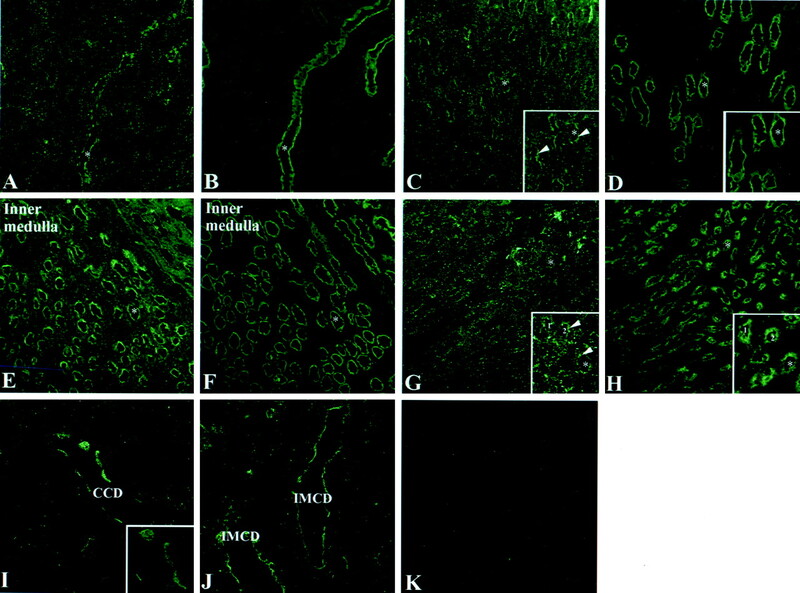 In this study, the intrarenal distributions of rOAT1, rOAT2, and rOAT3 were investigated by an immunofluorescence method that used frozen rat serial kidney sections. Confocal microscopic analysis showed that immunoreactivity for rOAT1 was detected exclusively in the proximal tubules (S1, S2, S3) in the cortex with basolateral membrane staining. rOAT2 was detected in the apical surface of the tubules in the medullary thick ascending limb of Henle’s loop (MTAL) and cortical and medullary collecting ducts (CD). rOAT3 was localized in the basolateral digitation of the cell membrane in all the segments (S1, S2, and S3) of the proximal tubules, MTAL, cortical TAL, connecting tubules, and cortical and medullary CD. These results on the distribution of each OAT isoform will facilitate the understanding of the role of OATs in the renal processing of organic anions. The tubular secretion of organic anions is an important function of the kidney that eliminates potentially toxic organic anions from the body. The transepithelial transport of organic anions is carried out in two steps in distinct membranes: organic anions are taken up from the peritubular plasma across the basolateral membrane and effluxed into the tubular lumen through the luminal membrane. Both steps are considered to be transporter mediated. The renal organic anion transport system, particularly the basolateral uptake step, has been extensively characterized by use of p-aminohippurate (PAH) as a prototypical substrate. It has been elucidated that the basolateral PAH transporter is a sodium-independent, organic anion/dicarboxylate exchanger and has a wide substrate selectivity for both endogenous and exogenous organic anions (1,2). In contrast, the transport properties of the luminal organic anion transporter(s) are under debate; the luminal anion transporter may be an anion exchanger or a uniporter (2). In 1997, the basolateral PAH transporter was cloned from a rat (3,4). Human (5,6), mouse (7), and flounder (8) homologs have also been identified. Rat OAT1 mRNA is expressed predominantly in the kidney and weakly in the brain (3). It is localized in the basolateral membrane of the proximal tubular cells S2 (9). As had been expected, OAT1 mediates organic anion/dicarboxylate exchange and mediates the transport of PAH, cyclic nucleotides, prostanoids, dicarboxylates, and many anionic drugs (3). Thus, OAT1 corresponds to the “classical organic anion transporter of the basolateral membrane.” Subsequently, three OAT isoforms have been cloned by use of a structure-based search. Rat OAT2 is predominantly expressed in the liver and relatively weakly in the kidney (10). Rat OAT3 is distributed in the kidney, liver, brain, and eye (11). Human OAT4 is expressed in the kidney and placenta (12). Thus, a new family of multispecific organic anion transporters, “the OAT family,” has been identified. The tissue distribution of each OAT isoform is unique; however, they are commonly expressed in the kidney, which indicates that the OAT family plays a principal role in the renal processing of organic anions. In addition to the OATs, several multispecific organic anion transporters, e.g., organic anion–transporting polypeptides and multidrug resistance–associated proteins, have been identified, some members of which are expressed in the kidney (13). It is postulated that tubular secretion of organic anions is mediated by the OAT isoforms in concert with organic anion–transporting polypeptides and multidrug resistance–associated proteins. Despite such accumulated knowledge about the organic anion transporters in the kidney, the contribution of each transporter in the tubular secretion of organic anions is not fully understood. With respect to the OAT isoforms, the physiologic and pharmacologic roles of OAT2, OAT3, and OAT4 remain largely hypothetical. To clarify their relevant roles in the transepithelial transport of organic anions in the kidney, it is essential to determine the intrarenal distribution and membrane localization of each OAT isoform along the nephron. In this study, we raised polyclonal antibodies against rOAT1, rOAT2, and rOAT3 and investigated the intrarenal distribution of these isoforms by an immunofluorescence method. Male Sprague-Dawley rats weighing 180 to 200 g were anesthetized with pentobarbital (50 mg/kg intraperitoneally), and kidneys were removed. The renal cortex, outer medulla, and inner medulla were dissected out and used to prepare total RNA for Northern blot analysis. Total (10 μg) RNA was fractionated on a 1% agarose, 0.7% formaldehyde denaturing gel, and the RNA fractions were transferred overnight to a nylon membrane. The membrane was hybridized with [α-32P]dCTP-labeled full-length cDNA of each OAT isoform overnight at 42°C in 40% formamide, 10% dextran sulfate, 4× SSC (1× SSC contained 150 mM NaCl and 15 mM sodium citrate [pH 7.0]), 7 mM Tris/HCl (pH 7.6), 0.8× Denhardt’s solution, 20 μg/ml salmon sperm DNA, and 0.5% sodium dodecyl sulfate (SDS). After hybridization, the membrane was washed twice at room temperature (2× SSC and 0.1% SDS for 20 min) and once at 60°C (0.2× SSC and 0.1% SDS for 20 min) and then autoradiographed. Hybridization of the membrane was performed by reprobing the same Northern blot membrane with each full-length cDNA probe after washing at high stringency (80°C, 10 mM Tris/HCl [pH 7.0], and 0.01% SDS). Polyclonal Antibody Production and Characterization. Rabbit polyclonal antibodies were raised against synthesized polypeptides of the carboxy terminus of rat renal rOAT1 (3), rOAT2, and rOAT3. The specificity of the antibodies was analyzed by Western blotting (9) or immunohistochemistry, as described below. Male Sprague-Dawley rats (180 to 200 g) were anesthetized with pentobarbital (50 mg/kg intraperitoneally) and perfused via the left ventricle with phosphate-buffered saline (PBS) followed by a periodate-lysine-paraformaldehyde solution (0.01 M NaIO4, 0.075 M lysine, and 0.0375 M phosphate buffer with 2% paraformaldehyde [pH 6.2]). Kidneys were postfixed with periodate-lysine-paraformaldehyde solution overnight at 4°C, washed with PBS, cryoprotected with 15% and 30% sucrose at 4°C, and embedded in O.C.T. Compound (Miles, Elkart, IN). For indirect immunofluorescence, frozen sections (5 to 6 μm) were thaw-mounted on poly-L-lysine–coated slides and air dried. The plasma membrane fraction from kidney cells was prepared by slightly modifying the methods described by Sactor et al. (14) and Scalera et al. (15). In brief, rat kidneys were perfused with ice-cold sucrose buffer that contained 0.25 M sucrose, 10 mM Tris/HCl buffer (pH 7.4), 1 mM ethylenediaminetetraacetic acid, and 0.1 mM phenylmethylsulfonyl fluoride to wash out the blood. The renal cortical and medullary tissues were separated, weighed, minced, and diluted 1:7 with sucrose buffer. The tissues were then homogenized by use of a glass/Teflon homogenizer, followed by centrifugation at 500 × g for 5 min. The resulting supernatant was recentrifuged at 6000 × g for 5 min. The uppermost layer of the pellet was separated from the lysosomal and mitochondrial fractions, resuspended in the supernatant, and recentrifuged at 6000 × g for 5 min. The resultant uppermost layer of the pellet was resuspended and recentrifuged at 16,000 × g for 5 min. After centrifugation, the uppermost layer of the pellet was then recentrifuged at 16,000 × g for 20 min. The resultant fluffy white uppermost layer (plasma membrane fraction) of the pellet was collected and resuspended in a small volume of sucrose buffer. Protein content was measured by the Bradford assay (Bio-Rad, Hercules, CA) with the use of bovine serum albumin as the standard. The plasma membrane fraction (25 to 100 μg) was subjected to SDS–polyacrylamide gel electrophoresis and electroblotted onto a polyvinylidene difluoride membrane (Millipore, Bedford, MA). The membrane was blocked for 2 h in 3% skim-milk–Tris–buffered saline (TBS; 20 mM Tris/HCl [pH 7.0], and 150 mM NaCl), washed with TBS, and then incubated with the rabbit polyclonal antibody at a dilution of 1:5000 or preabsorbed-rabbit polyclonal antibody in blocking solution overnight at 4°C. The membrane was then washed three times in TBS–0.1% Tween 20, incubated for 1 h with horse radish peroxidase–conjugated donkey anti-rabbit IgG (Amersham, Arlington Heights, IL), and then washed with TBS–0.1% Tween 20. Signal detection was by enhanced chemiluminescence (Amersham). The specificity of antibodies against OAT2 and OAT3 was determined by an absorption test, as described elsewhere for OAT1 (9). Sections were washed in PBS that contained 0.5% TritonX-100 for 15 min and then treated with PBS plus 2% TritonX-100 for 30 min at room temperature. Sections were incubated in blocking solution that contained 10% goat serum and 5% skim milk in PBS for 1 h, followed by treatment with the rabbit polyclonal antibody at a dilution of 1:1000 or preabsorbed-rabbit polyclonal antibody overnight at 4°C. After washing with PBS plus 0.5% TritonX-100, secondary antibodies were applied to sections overnight at 4°C at the following dilutions: FITC-conjugated goat anti-rabbit IgG, 1:200 (CAPEL, Durham, NC) for OAT1 and OAT3 staining and Alexa 488 fluorochrome-conjugated goat anti-rabbit IgG, 1:1000 (Molecular Probes, Eugene, OR) for OAT2 staining. Sections were washed with PBS plus 0.5% Triton X-100 and then mounted with Vectashield (Vector Laboratories, Burlingame, CA). Sections were viewed on a Zeiss Axiophot microscope equipped with an epifluorescence detector and a Bio-Rad MRC 1260 confocal imaging system. In addition, to identify renal tubule segments for the localization of OAT gene products, antibodies against rat aquaporin 1 (16) (AQP1, 1:500, Chemicon International, Temecula, CA), rat aquaporin 3 (17) (AQP3, 1:500, Chemicon International), and human Tamm-Horsfall protein (18) (THP, 1:7500, Chemicon International) were used to identify the S3 segment of the proximal tubule, thick ascending limb of Henle’s loop (TAL) and collecting duct (CD), respectively, in serial cryostat sections of rat kidney. FITC-conjugated goat anti-rabbit IgG and FITC-conjugated rabbit anti-sheep IgG at 1:200 dilution (CAPEL) were used for AQP1 and AQP3, and THP staining, respectively. The mouse anti-rat calbindin D28 antibody (1:2000, Sigma, St. Louis, MO), a marker for connecting tubules (19), and Cy3-labeled donkey anti-mouse IgG (1:1500, Amersham) for calbindin D28 staining were also used for double staining with OAT3 antibody. Northern blot analysis showed that expression of OAT1 and OAT3 mRNAs was detected in the cortex and the outer medulla with predominant expression in the cortex. 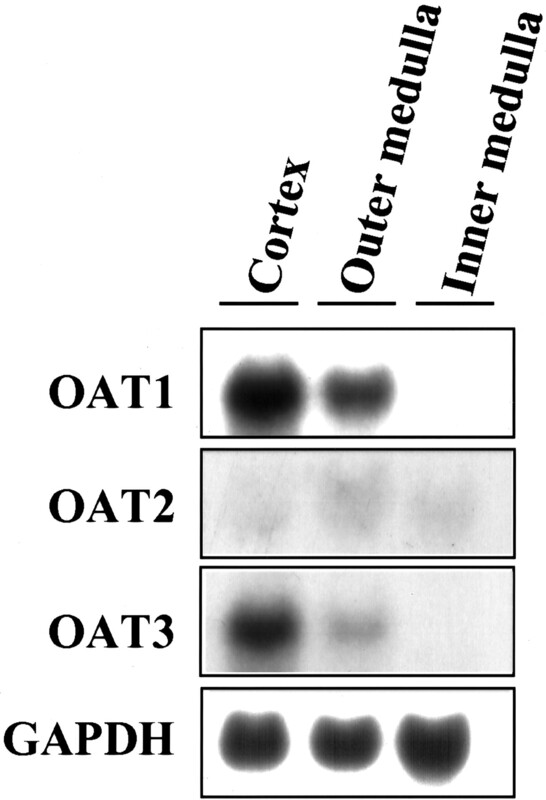 Although expression of OAT2 mRNA was much lower than that of OAT1 and OAT3 mRNAs, it was detectable in the cortex and the medulla (Figure 1). Figure 1. 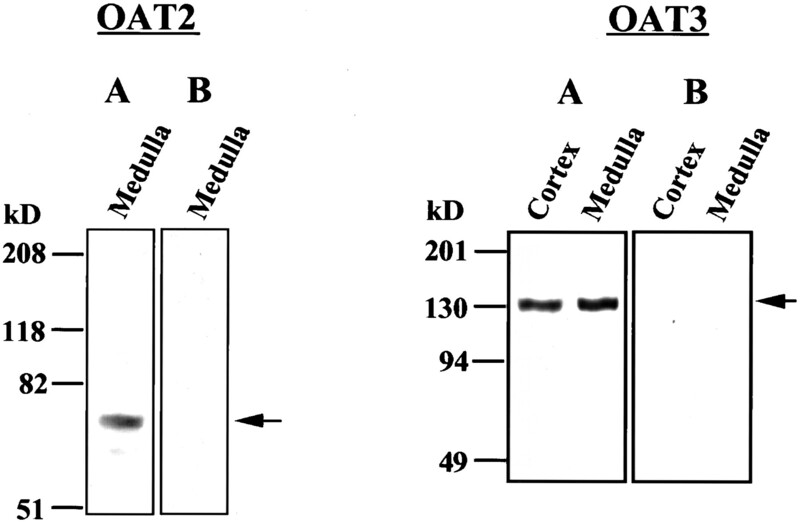 Northern blot analyses of expression of OAT1, OAT2, and OAT3 mRNAs in the rat kidney. Total RNA (10 μg) prepared from male rat kidney was used for Northern blot analyses, and hybridization with each cDNA probe was performed by use of the same Northern blot membrane after washing. OAT1 and OAT3 mRNAs were expressed in the cortex and the outer medulla, with predominant expression in the cortex. Expression level of OAT2 mRNA in the kidney was much lower than those of OAT1 and OAT3. GAPDH confirms equal loading of RNA samples. Western blots of rat kidney membrane proteins showed signals for rOAT2 and rOAT3 with protein sizes of 60 and 130 kD, respectively. These signals were not observed when the antibodies were preabsorbed with the specific peptide, which indicates the specificity of the 60- and 130-kD signals for the rOAT2 and rOAT3 protein, respectively (Figure 2). Figure 2. Western blot analyses of rOAT2 and rOAT3 by use of rat kidney plasma membrane fraction. Plasma membrane fractions prepared from kidney cortex and/or medulla were analyzed by 7.5% sodium dodecyl sulfate (SDS)–polyacrylamide gel electrophoresis (PAGE), transferred to a membrane, and probed with polyclonal antibody (1:5000). For detection of rOAT2, 100 μg of the membrane protein from the renal medulla was used. For rOAT3 analysis, 100 and 25 μg of the membrane proteins derived from the renal cortex and medulla, respectively, were subjected to SDS-PAGE. The peptides of OAT2 and/or OAT3 (50 μg/ml) were incubated with antibodies to OAT2 and/or OAT3 (1:250) for 2 h at room temperature. The preabsorbed antibodies were also used for Western blot analyses as described in the Materials and Methods section. (A) Polyclonal antibody. (B) Preabsorbed antibody. As shown in Figure 3, confocal microscopic analysis revealed that abundant rOAT1 was detected in the proximal tubule. No obvious fluorescence signal was observed in the outer or inner medulla or in the glomeruli. rOAT2 was detectable in the renal cortex and medulla, but its expression level was much lower compared with those of rOAT1 and rOAT3. rOAT3 was expressed in all the segments (S1, S2, and S3) of the proximal tubules in the cortex and tubules in the outer and inner medulla. Immunostaining for rOAT3 was most intense in the cortex in cross-sections of the kidney. The expression level of the OAT proteins in the cortex and outer and inner medulla of the rat kidney was parallel to that of their mRNAs shown in Figure 1. Figure 3. Low-magnification confocal microscopic views showing the localization of rOAT1, rOAT2, and rOAT3 in serial sections of the rat kidney. 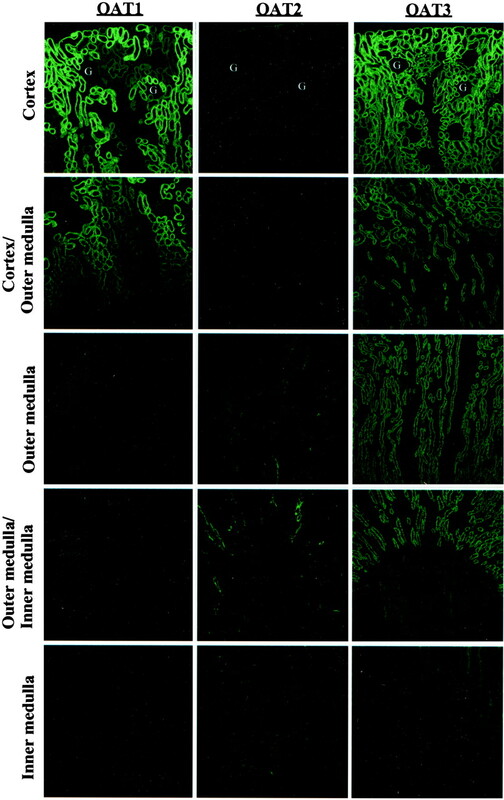 To compare the expression level of the OAT1, OAT2, and OAT3 in the rat kidney, the labeling conditions and settings of the confocal microscope were identical for all observations in Figure 3. The OAT1 was detected in the proximal tubules. No obvious fluorescence was observed in the outer or inner medulla or in the glomeruli. The fluorescence intensity of rOAT2 was much weaker than those of rOAT1 and rOAT3. The OAT3 was present in the proximal tubules and tubules in the outer and inner medulla. G, glomerulus. Magnification, ×100. To further identify the segments of the proximal tubule in which expression of rOAT1 occurs, an anti-AQP1 antibody was used for staining serial kidney sections. The white box in Figure 4A shows rOAT1 immunolocalization in the corticomedullary junction, and Figure 4, B and C, indicate rOAT1 and AQP1 staining, respectively, in the same region. As shown in Figures 4, B and C, the distribution pattern of the weaker staining for rOAT1 was consistent with labeling of the S3 segment of the proximal straight tubule, as identified by the thicker brush border and basolateral membrane staining for AQP1. 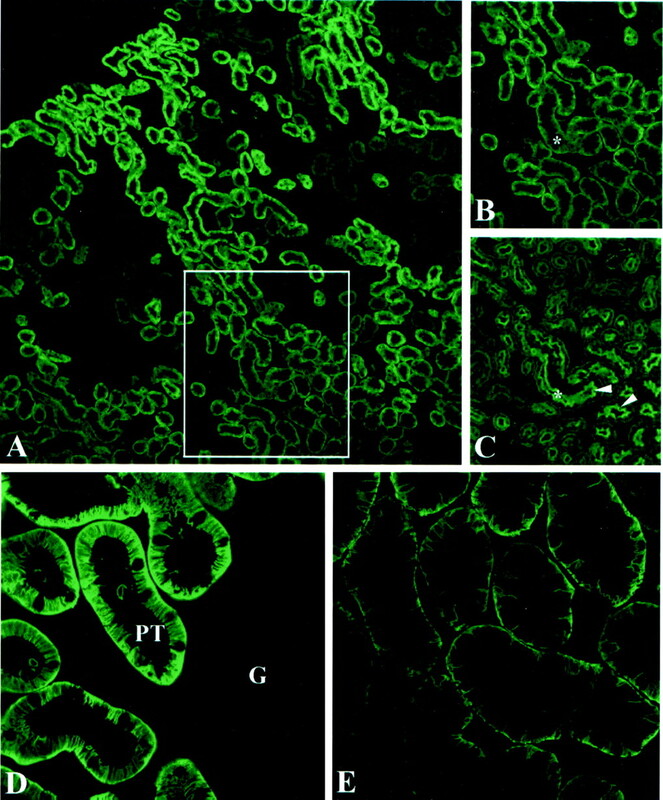 A weaker immunofluorescence signal was also seen in the S1 segment of the proximal tubule around the glomeruli (Figure 4A). These results indicated that rOAT1 was present in the S1 and S3 segments of the proximal tubule as well as the S2 segment. No obvious immunofluorescence for rOAT1 was observed in the descending thin limb of Henle’s loop in the outer medulla, which was also recognized as the AQP1-positive tubule (data not shown). Figure 4. Immunostaining of rOAT1 in the renal proximal tubule. (A) rOAT1 immunostaining viewed at low magnification. The white box shows the corticomedullary junction. (B and C) rOAT1 and aquaporin 1 (AQP1) immunostaining within the white box, respectively. In the corticomedullary junction, rOAT1 was present in the S3 segment of the proximal tubule, which was identified as AQP1-positive tubules. Arrowheads indicate brush-border membranes of the S3 segment of the proximal tubule. *Location of the same renal tubule in serial kidney sections. (D and E) High-magnification views of rOAT1 immunostaining. rOAT1 was exclusively located along the basal digitation of cell membranes in the (D) S2 and (E) S3 segments of the proximal tubule. PT, proximal tubule. Magnifications: ×100 in A, B, and C; ×630 in D and E.
In addition, confocal microscopic observation at high magnification was also carried out to clarify the subcellullar localization of the OAT1. As shown in Figure 4, D and E, rOAT1 was located along the basal infoldings of the cell membrane in the S2 (Figure 4D) and S3 (Figure 4E) segments of the proximal tubule, and the OAT1 level in the S3 segment was lower than that in the S2 segment. In this experiment, an antibody against AQP3 was used to determine whether rOAT2 is localized in CD in the cortex and the medulla. An anti-THP antibody was also used as a marker for the identification of TAL. As shown in Figure 5, A though H, distribution patterns of immunoreactivity for OAT2 in the cortex (Figure 5, A and B), the outer medulla (Figure 5, C and D), and the inner medulla (Figure 5, E and F) coincided with those for AQP3 in serial kidney sections. THP immunostaining revealed that the OAT2 was also expressed in the medullary TAL (Figure 5, G and H). In this study, rOAT2 was not detectable in the cortical TAL. As shown in the inset in Figure 5G, rOAT2 showed a spotty and patchy staining pattern rather than linear staining in the medullary TAL. Figure 5. Tubular distribution of rOAT2 in the rat kidney. rOAT2 (A) and AQP3 (B) immunostaining in the cortex. rOAT2 (C) and AQP3 (D) immunostaining in the outer medulla. rOAT2 (E) and AQP3 (F) immunostaining in the inner medulla. rOAT2 (G) and Tamm-Horsfall protein (THP) (H) immunostaining in the outer medulla. The OAT2 protein was expressed in the medullary thick ascending limb of Henle’s loop and the cortical and medullary collecting duct. No obvious rOAT2 immunoreactivity was detected in the cortical thick ascending limb of Henle’s loop. Arrows (insets in C and G) indicate rOAT2 immunostaining. Asterisks and numbers represent the position of the same renal tubule in serial cryostat sections of the kidney. (I and J) High-magnification views of rOAT2 immunostaining. rOAT2 was localized in the apical membrane (also see inset) of the (I) cortical and (J) inner medullary collecting duct. K, preabsorbed antibody; CCD, cortical collecting duct; IMCD, inner medullary collecting duct. Magnifications: ×200 in A through H; ×630 in I and J. In a high-magnification view, rOAT2 immunoreactivity was clearly seen to be localized on the apical surface of the cortical CD (Figure 5I, also see inset) and the inner medullary CD (Figure 5J). The specificity of antibodies to rOAT2 was also evaluated by use of a preabsorbed polyclonal antibody and by negative staining without a primary antibody (Figure 5K). Immunostaining with anti-AQP3 and anti-THP antibodies of serial kidney sections was also carried out to identify the tubule segments in which rOAT3 is localized. In the kidney cortex, rOAT3 was detected not only in the proximal tubules but also in CD, as demonstrated by colocalization with the AQP3 (Figure 6, A and B). In the outer medulla, immunoreactivities for THP and AQP3 showed that rOAT3 was localized in TAL (Figure 6, C and D, also see inset) and the outer medullary CD (Figure 6, E and F, also see inset). The fluorescence intensity for rOAT3 in CD was much weaker than that in TAL (Figure 6, C and E). As shown in Figure 6, G and H, the OAT3 protein is also seen in inner medullary CD. Figure 6. Tubular distribution of rOAT3 in the rat kidney. rOAT3 (A) and AQP3 (B) immunostaining in the cortex. rOAT3 (C) and THP (D) immunostaining in the outer medulla. rOAT3 (E) and AQP3 (F) immunostaining in the outer medulla. rOAT3 (G) and AQP3 (H) immunostaining in the inner medulla. The OAT3 protein was detected in the thick ascending limb of Henle’s loop and collecting duct. Arrows in panel E indicate rOAT3 immunostaining. Asterisks and numbers denote the position of the same renal tubule in serial kidney sections. (I through K) High-magnification views of rOAT3 immunostaining. OAT3 was present in the (I) proximal tubules, cortical thick ascending limb of Henle’s loop and CCD; (J) the medullary thick ascending limb of Henle’s loop and outer medullary collecting duct (OMCD); and (K) the IMCD. Inset in panel K shows a cross-section of the collecting duct in the inner medulla. The kidney section following that in panel I was used for a negative control, and (L) immunostaining with preabsorbed antibody failed to show any staining for rOAT3. MTAL, medullary thick ascending limb of Henle’s loop. Magnifications: ×200 in A through H; ×630 in I through L.
Figure 6, I to L, shows high-magnification observations. rOAT3 was detected in the basal infoldings of the proximal tubule and TAL and in cortical CD (Figure 6I). In the outer medulla, immunoreactivity for rOAT3 was also seen in the basolateral membrane in TAL and outer medullary CD (Figure 6J). As shown in the inset, which depicts a cross section of CD, in Figure 6K, immunoreactivity for rOAT3 also showed a clear basolateral pattern of staining in the epithelial cells of CD. The specificity of the antibody was demonstrated by the absence of signal when the anti-OAT3 antibody was preabsorbed with the specific antigen used for preparation of the antibody (Figure 6L). A rat kidney section was incubated with the anti-OAT3 and anti-calbindin D28 antibodies and double stained with FITC- and Cy3-labeled IgG. Double labeling with the anti-calbindin D28 antibody, a marker for connecting tubules, demonstrated that the OAT3 protein was present in the connecting tubules (Figure 7, A to C). Additionally, colocalization of rOAT2 with calbindin D28 was not detected in this study (not shown). Figure 7. Double staining analyses of rOAT3 and calbindin-D in the rat kidney cortex. 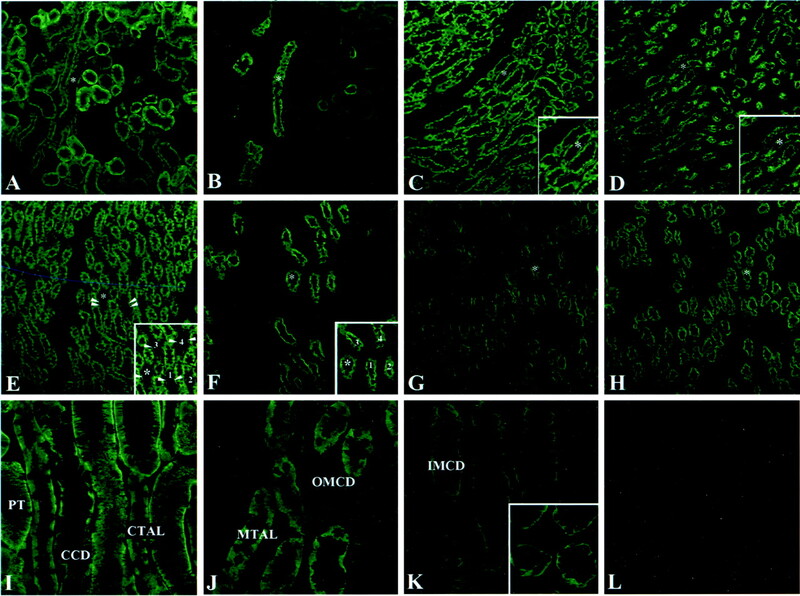 A rat kidney section was incubated by use of anti-OAT3 and anti-calbindin D28 antibodies and double stained with FITC-labeled and Cy3-labeled IgG. (A) rOAT3 and FITC staining. (B) Calbindin-D28 and Cy3 staining. (C) Overlay of panels A and B. The rOAT3 was present in the connecting tubules, which were recognized by calbindin D28 staining. Magnification, ×200. Although several OAT isoforms have been identified to date, their physiologic and pharmacologic roles remain unclear, except for those of OAT1. Information on their intrarenal localization is essential to elucidate the relevant roles of each isoform in the renal processing of organic anions. This study reveals the distinct distribution and membrane localization of OAT1, OAT2, and OAT3 in the rat kidney. As has already been demonstrated, rOAT1 is exclusively localized in the basolateral membrane of the proximal tubular cells (Figures 3 and 4). In a study elsewhere that used diaminobenzidine staining, rOAT1 was detected only in the S2 segment (9). In this study, however, the expression of rOAT1 was observed not only in the S2 but also in the S3 and S1 segments, although the expression levels were much lower than that in the S2 segment (Figure 4). We consider that this difference arose because of the higher sensitivity of the immunofluorescence technique when confocal microscopy is used rather than diaminobenzidine staining. It has been indicated that the tubular secretion of PAH occurs from the S1 to S3 segments, and the highest transport activity was found in the S2 segment in the rabbit kidney (20). This observation coincides well with the distribution of rOAT1 in the proximal tubular cells. It can be concluded that rOAT1 is expressed most strongly in the basolateral membrane of the S2 segment of the proximal tubular cells; lower level but definite expression is present also in the S1 and S3 segments. In the proximal tubule cells, rOAT3 is localized in the basolateral membrane of the S1, S2, and S3 segments. rOAT3 shows a very wide substrate selectivity similar to that of rOAT1 (11). In the proximal tubular cells, rOAT3 is considered to function as a subsystem for the basolateral uptake of organic anions from plasma. Although the substrate selectivities of rOAT1 and rOAT3 overlap, the transport modes of OAT1 and OAT3 are distinct. OAT1 functions as an organic anion/dicarboxylate exchanger, whereas OAT3 does not (11). With respect to the transport of PAH, OAT1 mediates high-affinity transport (Km = 13.4 μM) (3), whereas OAT3 mediates relatively low-affinity transport (Km = 65 μM) (11). If we only focus on the tubular secretion of PAH, the contribution of rOAT3 might be underestimated. On the other hand, rOAT3 shows high affinity to many substances, such as β-lactam antibiotics and sulfate and glucuronide conjugates. In this study, we demonstrated a difference in segmental localization in the proximal tubule between rOAT1 and rOAT3. This finding may suggest that the contributions of rOAT1 and rOAT3 in the basolateral uptake of organic anions differ greatly. Further investigation is required to clarify this. This study revealed that rOAT3 is also expressed in the TAL, the distal tubule, connecting tubule, and CD cells. It has previously been believed that the main site of transepithelial transport of organic anions is the proximal tubular cells; information on organic anion transport in other nephron segments has been greatly limited. However, several researchers have reported the transport of organic anions, e.g., urate (21,22) and salicylate (23), in Henle’s loop, the distal tubule, and CD. In addition, molecular investigations have resulted in the assignment of several organic ion transporters in an unexpected segment; human organic cation transporter (OCT) 2 was localized in the distal convoluted tubule (24) and mouse OCT3 in the proximal tubule and distal convoluted tubules (25). The relevance of rOAT3 expression in segments other than the proximal tubules requires further investigation. In this study, rOAT2 was localized in the luminal membrane of TAL and CD, whereas rOAT2 was not detected in the proximal tubular cells (Figures 3 and 5). The result of Northern blot analysis (Figure 1), in which rOAT2 expression was detected equally in the cortex and outer and inner medulla, is consistent with this result. This localization of rOAT2 had not been expected, and it is difficult to specify the role of rOAT2 in the kidney. Nonetheless, the substrate selectivity of rOAT2 may provide some clues, considering the pharmacologic and physiologic characteristics of rOAT2. rOAT2 mediates sodium-independent uptake of salicylates, acetylsalicylates, and prostaglandin E2 in addition to PAH and dicarboxylate (10). It has been reported that salicylate is not only secreted but also reabsorbed in the other segments than the proximal tubular cells. Nephrotoxicity is a major side effect in the medical use of NSAIDs and is termed “analgesic nephropathy.” The principal site of injury in analgesic nephropathy is the medulla. The mechanism that underlies analgesic nephropathy is not well understood; however, a possible explanation is the accumulation of NSAIDs in the distal nephron, which might be mediated by OAT2. From a physiologic point of view, OAT2 may be involved in the local concentration of prostanoids. Cortical and medullary CD produce a large amount of prostaglandins, predominantly prostaglandin E2, whereas the proximal tubule and the loop of Henle show little ability to produce prostaglandins. The sites of production of PGE2 coincided with that of rOAT2, and OAT2 may regulate the local concentration of PGE2 in the renal medulla. Becaue a large amount of PGE2 is secreted into urine, rOAT2 may efflux PGE2 out of the cytosol and/or apical membrane. The membrane localization and intrarenal distribution of rOAT2 are distinct from those of rOAT1 and rOAT3. Phylogenetic analysis placed OAT2 evolutionarily distant from OAT1 and OAT3 (26). The chromosomal localization of rOAT2 is also different; human OAT1 and OAT3 are localized on 11q (5,27), whereas rOAT2 is located on a different chromosome (unpublished observation). This suggests that OAT2 is evolutionarily distant from OAT1 and OAT3, which may be reflected by the distinct membrane localization and distribution of rOAT2 in the kidney. Recently, Pavlova and colleagues (28) reported the results of in situ hybridization of OAT1, OAT2, and OAT3 in the mouse kidney. They indicated that the expression of OAT1, OAT2, and OAT3 mRNAs appears to be stronger in the cortex than in the medulla. With respect to rOAT2, their result is different from that in this study. They used rat OAT2 cDNA as a hybridization probe for the mouse kidney, which may have resulted in the different distribution of OAT2. Another possibility is the species difference in nephron localization between rat and mouse OAT2. In conclusion, we reported the intrarenal distribution and membrane localization of rOAT1, rOAT2, and rOAT3. Expression of rOAT1 was restricted to the basolateral membrane of the proximal tubules. rOAT3 was detected in nearly all of the nephron segments except descending and ascending thin limbs. rOAT2 was localized in the luminal membrane of the TAL and CD cells. Information on the distribution of each isoform will facilitate understanding the role of OAT isoforms in the renal processing of organic anions. This work was supported in part by Grants from the Japanese Ministry of Education, Culture, Sports, Science and Technology, the Science Research Promotion Fund of the Japan Private School Promotion Foundation, and Research on Health Sciences Focusing on Drug Innovation from The Japan Health Science Foundation. The Molecular Pharmacology of Organic Anion Transporters: from DNA to FDA?